This is our May 2015 roundup of the best new premium WordPress themes. As the weather warms up (in the northern hemisphere at least) the number of new WordPress themes being released is slowing. However we’ll be updating this post throughout the month with all the fresh new premium WordPress themes released by independent theme shops. NewsPaper is a modern and professional looking blog / magazine theme for WordPress. 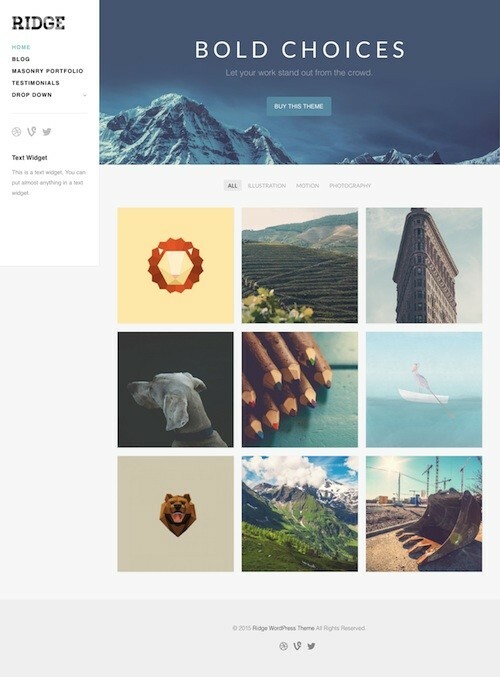 The premium theme from MyThemeShop has an attention grabbing design thanks to its clean flat design and use of large featured images on the homepage as well the single post pages. It would be ideal for any type of blog or online magazine website wanting to stand out from the crowd. The NewsPaper theme also has an impressive set of features and functionality. Some of the key features include: a mobile friendly responsive design, featured and tabbed sections to highlight your best content, popular categories section, “as seen on” section, integrated banner and Adsense placements, lots of customization options, great typography with Google fonts, icons, author box, unlimited colors and backgrounds, off-canvas mobile menu, mega menu and review system compatibility, speed and search optimization and more. Balanced is a responsive multi-purpose WordPress theme from Press75. 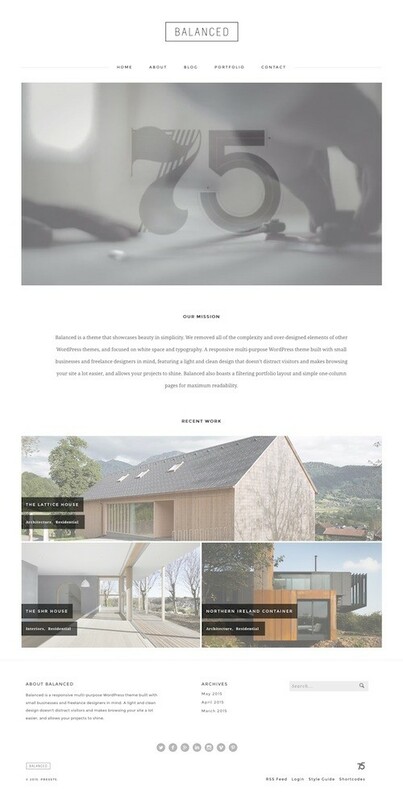 The premium theme has a simple, light and modern design that doesn’t distract visitors and ensures your projects stand out. The theme would be ideal for small businesses, freelance designers, creative professionals, portfolio and photography websites, websites to showcase products or services, or anything else. Some of the key features of the theme include: a custom homepage layout with option to display projects or your blog posts, filterable portfolio layout with beautiful subtle animations, homepage looping video option, simple one-column page layouts for maximum readability, WordPress Customizer (to change the site title, link color(s), accent color(s), upload your own logo, customize the theme’s page templates and more), shortcodes, a fully mobile friendly responsive design and more. Arvios is a professional, mobile responsive one page WordPress theme with a clean and modern design. The premium theme from ThemeJug is perfect for freelancers, businesses and agencies after a contemporary and customizable design to present their work and services. Arvios has deep integration with the WordPress Customizer so you can easily move sections around via drag and drop and have full control over the elements of each section: text, colors, images, backgrounds. Some of the other key features of the theme include: large header with slider, video background or static background image, blog template with list, grid or masonry layout, WooCommerce compatibility, filterable portfolio, unlimited color options, one click demo content install, Google maps, translation ready, and more. Parenting is a magazine blog WordPress theme designed specifically for parenting blogs, parenting magazines, or other mommy or female oriented websites. The premium theme from Magazine3 has a clean and modern design with a hybrid blog and magazine design that’s easy to navigate. It allows you to display featured articles up the top with the latest blog posts below. The Parenting theme coded to WordPress standards and has a fully responsive design so its mobile friendly and works nicely on all mobile devices such as iPhones and iPads. It includes support for the WordPress Customizer so you can easily control the theme and make customization changes in real time. Some of the other features include: advertising placements, color scheme picker, custom widgets, compatability with popular WordPress plugins, valid HTML5 markup, translation support, drag and drop menu, easy logo upload, and more. Ultra is an extremely powerful and flexible drag and drop WordPress website builder theme from Themify. 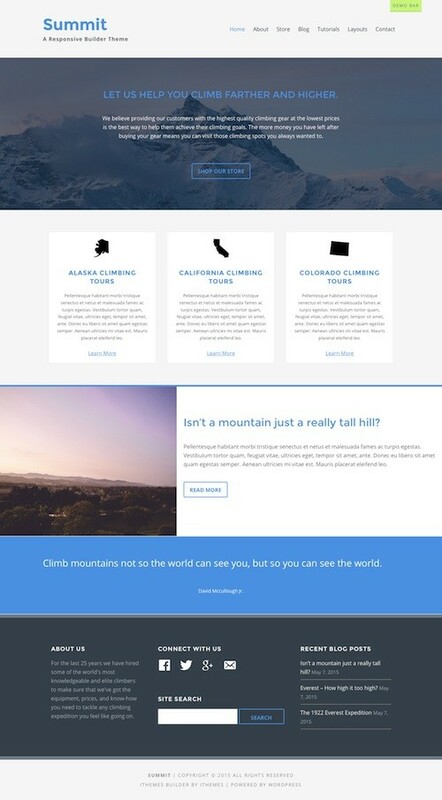 The theme gives you total control from the header to the footer on either site-wide or per-page basis so you can create any type of mobile friendly responsive website you want. 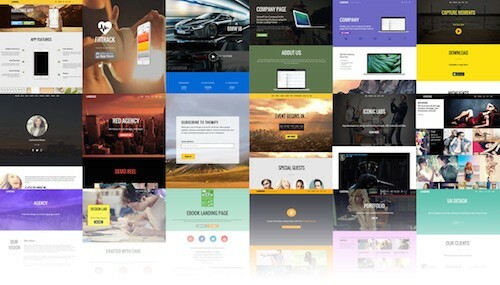 Some of the key features of the theme include: drag and drop builder to create unlimited responsive layouts, 25+ professional pre-made layouts, 6 different header / page designs (block, horizontal, boxed-content, left-panel, boxed-layout, min-bar, or none), header background options (image, transparent, slider, video, animated colors etc), beautiful typography options (600+ Google fonts), unlimited color options, 6 different post layouts (slider, full width, masonry, grids, polaroid, and overlay with ability to toggle the visibility of the post elements such as post title, featured image, meta, content, etc), animating colors, portfolio and image filters, WooCommerce integration, customize panel (to style almost every element of the theme), hook content, auto theme updates, social icons, WPML compatible, and more. Plugin Hunt Grid is a new grid layout child theme for the Plugin Hunt theme from Epic Themes and Plugins. Plugin Hunt is a content curation WordPress theme that allows you to build a site similar to the Product Hunt website. Users can submit content from the front end and the content is grouped by the day of submission. You can submit any type of link and it will embed that content into the pop out panel. It supports embeddable content from 30+ websites (such as YouTube, Vimeo, Spotify, Instagram, Kickstarter, TED, Tumblr, Twitter, Vine, Soundcloud, Blip, Flickr and more). So the plugin hunt package therefore gives you the ability to create ranking websites in a wide range of fields. Visitors can view the content is a “pop out panel”, comment in the fly-out box, and vote up / down content using the wpeddit algorithm. Its built on the Bootstrap framework, is easy to install, translation ready and mobile friendly. Summit is a simple and flat WordPress multipurpose child theme for the Builder framework from iThemes. It has a modern, full width and mobile friendly responsive design suitable for businesses, ecommerce stores and blogs. It features a simple and usable homepage layout with featured image and sections for information, built-in ecommerce styles for the Exchange ecommerce plugin, ability to build you own page layouts with the Builder layout engine, mobile navigation menu, full window images, various alternative module styles, pre-made easy to use page layouts, Gravity Forms styling, and all the other features and benefits of the Builder Framework. iMedical is a medical WordPress theme with a clinical and professional design from Theme Junkie. The commercial theme is designed specifically for medical centers, dentists, doctors, GPs, vets, general practice, health care, ambulance, health & beauty, spa centres or even hospital websites. The iMedical theme is mobile friendly with a responsive design and comes with a lot of other handy features and functionality. Some of the key features include: an easy to use page builder and lots of customization options, 2 types of mega menu, premium timetable plugin, custom post types (doctor, department, service, testimonials, slider), 9 custom widgets, multiple post / page layouts, scheme.org markup, shortcodes (via a plugin), search engine optimized, advanced control panel, translation options and more. Insight is a great looking magazine WordPress theme with a modern, clean and minimal design. The premium theme from WPZOOM would be ideal for any type of professional blog or online magazine website – design, travel, architecture, food, photography, fashion and lifestyle or anything else. Some of the key features of the Insight Magazine theme include: a widgetized homepage, featured categories, a touch enabled slider, 3 color schemes and options to create your own, 2 post layout options (grid or list), visual customizer, JetPack feature support (for Tiled Galleries, Related Posts, Extra Sidebar Widgets, etc), advanced WPZOOM framework for easy control and customization, custom logo and backgrounds, menu management, SEO friendly code, and a mobile friendly responsive design so it works perfectly on all devices. Money Flow is a professional and modern blog / magazine WordPress theme built for people who are serious about making money online. The premium theme from MyThemeShop has an appealing and engaging design with lots of great features and monetization options built in so you can increase your earnings. Some of the key features of the theme include: custom homepage with featured slider and featured sections, built-in ad management options (Adsense integration in your posts), WooCommerce integration, AJAX category filters, parallax scrolling, off-canvas mobile menu, awesome fonts and icons, powerful options panel, unlimited colors, Google fonts, mobile friendly responsive design, speed and search engine optimization, translation ready and more. Darling is a beautiful feminine styled multi-use WordPress theme from Restored 316 Designs. The versatile premium theme is a child theme for the Genesis Framework and could be used for any genre of website, personal blog, business site, ecommerce store or anything else you can imagine. It has heaps of great features and is customizable so you can make it your own. Some of the key features include: unlimited color schemes, 3 layout options, WooCommerce ready, featured images on single posts, customizable homepage, drop cap letters, custom category archives, add your own logo, mobile friendly responsive design, custom background, 3 footer widgets, styling for various quality plugins, HTML5 markup and more. Maisha is a great looking and powerful charity and non profit WordPress theme with a modern and mobile friendly responsive design. The premium theme has a number of handy features such as different header options, various blog layouts, extensive color options, a number of different page templates and support for popular plugins like bbPress, BuddyPress, WooCommerce and Events Calendar. The theme is easily customizable directly from the WordPress customizer. 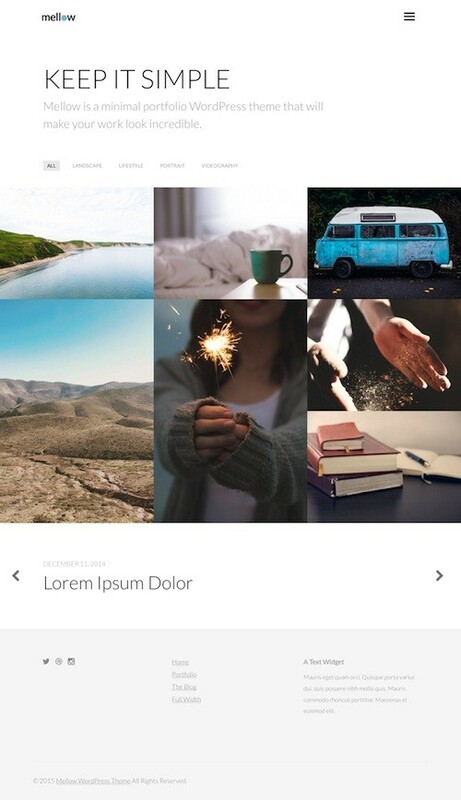 You can find more themes from previous months in the theme collection archive or our collections of only the best premium themes organized by style / niche.